Approximately 17 x 24.5cm. 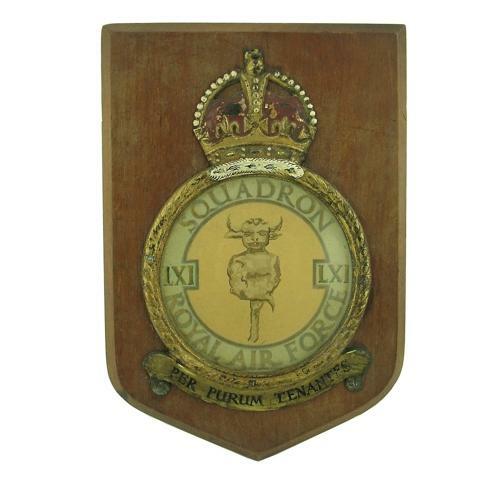 Wooden shield with a 61 squadron crest. The King's crown, surround and scroll with squadron motto are all cast in metal and hand painted. The squadron badge features the famous lincoln Imp, a figure associated with the district in which it was re-formed in 1937 and where it spent most of its active days in during the war. The motto at the bottom reads 'Per Purum Tenantes' ( Thundering through the clear air). The entire badge is hand painted and covered with a disc of clear perspex. The plaque shows age related wear but is in very good overall condition. A very nice vintage plaque, not to be mistaken with the more modern mass produced examples. Stock code M23064.